Last Updated: March 19, 2019 · Published: July 11, 2016 By: Asian Caucasian 2 Comments This post may contain affiliate links or sponsored content. 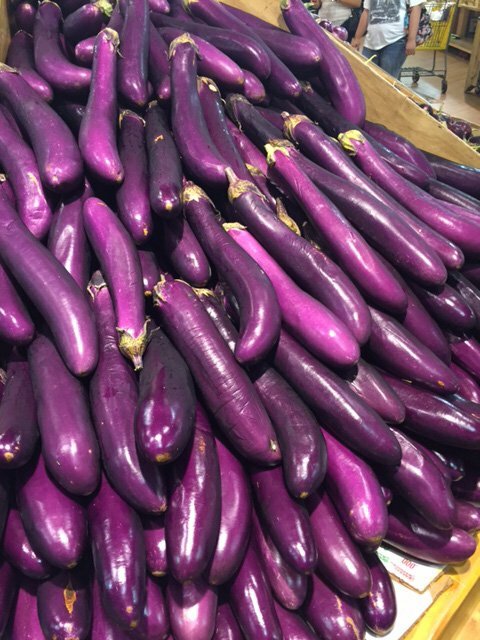 Last week, as I was strolling through my all time favorite Asian market in Atlanta (the Buford Highway Farmer’s Market), these incredibly gorgeous Chinese eggplant caught my eye and inspired me to make a spicy Szechuan dish that I can’t wait to share with you! I added veggies and chicken, and the sauce is sweet and savory with a little heat (just the way I like it!). I used dried sambal oelek, which is one of the spice packets from RawSpiceBar.com that I received as a gift from my two kids. The jarred sambal oelek works great as well! Be careful not to use too much or your mouth will need a fire extinguisher! Cut the ends of the eggplant and slice on a diagonal into one inch pieces. Place in a microwave-safe bowl and cover pieces with water. Microwave for 1 1/2 minutes until just soft but not mushy, checking on it after 1 minute. Remove from oven, drain and pat dry on paper towels. Set aside. To make the sauce: In a small bowl whisk together the chicken broth, soy sauce, oyster sauce, rice vinegar, tomato paste, sesame oil, sambal oelek, and brown sugar. Stir in cornstarch until dissolved. Set sauce aside. Season chicken pieces with salt and pepper. Cook chicken pieces in a large wok over medium high heat with 1 tablespoon canola oil until browned on both sides but not cooked through. Remove chicken from wok and set aside. 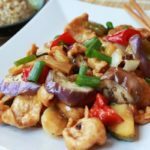 Add eggplant slices to wok in a single layer and cook until crisp and light golden brown, about 2 minutes on each side. Remove eggplant from pan and set aside. Heat remaining tablespoon canola oil in the pan over high heat and add garlic and shallots. Cook until fragrant and translucent. Add in bell peppers and cook about 2-3 minutes. Add in green onions, ginger, and shiitake mushrooms and cook another 3 minutes. Stir in the sauce and eggplant, and chicken and cook until sauce has thickened, about 3-5 minutes. Remove from heat. Garnish with extra green onions, and serve with a side of steamed rice. Notes: Dried sambal oelek can be purchased from RawSpiceBar.com. Jarred sambal oelek can be found at select grocery stores and specialty Asian markets. I cooked this recipe tonight, and it was absolutely delicious!! Just the right amount of heat, and very flavorful! I ran out of time and used quinoa instead of rice, which was fine. I’m definitely planning to make this again!